Daniel Bryan comments on his contract status and the likelihood of remaining with the WWE, Joey Janela's Lost in New York card tonight, Ronda Rousey on public speaking issues, Seth Rollins comments on The Rock at WrestleMania, Elias concert canceled, review of Impact Wrestling, LU viewership drops & more. **We have a new edition of Rewind-A-Wai posted on the POST Wrestling Café with Wai Ting and I reviewing WCW’s Bash at the Beach event from July 1998. The card was headlined by Hollywood Hogan & Dennis Rodman taking on Diamond Dallas Page & Karl Malone following the Chicago Bulls defeat of the Utah Jazz in the NBA finals that year. We go over the entire period of WCW’s history, the numbers that show July 1998 was the most successful month in their history, the aftermath of Bill Goldberg’s WCW title win the prior week at the Georgia Dome and how he was used on this show, Bret Hart’s status after seven months with WCW and tons of notes from the show. This show was selected by Espresso Executive Producer Thorsten Wendelmuth and is available to all members of the POST Wrestling Café. **On Saturday, Chris Charlton returns with the latest installment of the EGGSHELLS Podcast Companion and this week he discusses the Tokyo Dome cards from 1997 with Nate Milton, who was living in Japan during this era. This was a year when New Japan was on fire and had a big working relationship with WCW. That show will be free on the site and you can subscribe to the free POST Wrestling RSS feed to hear it. **Saturday night will feature an NXT TakeOver post show as I will be joined by Braden Herrington & Davie Portman for a complete rundown of the show. Davie is attending the show live at the Barclays Center, so we will hear his live thoughts on the show. **Wrapping up our coverage this Sunday night will be our SummerSlam review with Wai Ting & I posting a show late Sunday to chat about the 6+ hour event. 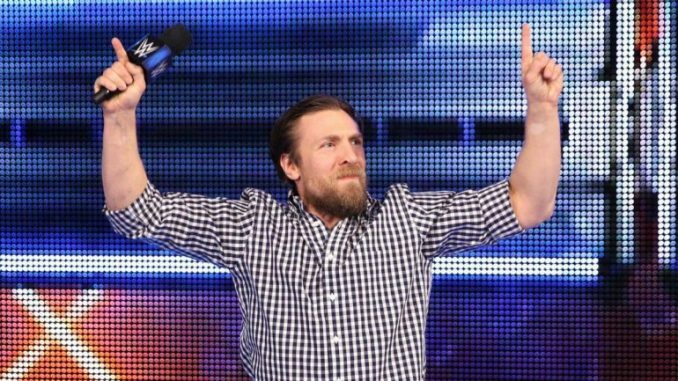 **Daniel Bryan was a guest on Sam Roberts’ podcast and said it was “very likely” he would be re-signing with WWE and gave a figure of higher than 90% as the likelihood he will remain with the company. Bryan said he has not signed yet, but it could be as soon as the end of this week or over the next several weeks. Bryan would clearly have numerous options beyond the WWE given the current state of the industry. For a long time, Bryan has aspirations of working against Atlantis at a CMLL Anniversary card in a Hair vs. Mask match to the point he was growing out his hair. At 37 years of age, having the unpredictable outcome that the WWE’s medical staff reversed their decision and cleared him, he is probably very happy where he is at this stage. On top of that, so many of his friends he came up within the industry are now with WWE and the list goes on of reasons to stay. Obviously, if he were to change his mind he would become the hottest free agent on the market and a huge asset for Ring of Honor, New Japan Pro Wrestling and countless promotions that would spend top-end money to book him. The funniest part of the interview was when Sam asked Bryan about the backup plan with Shane McMahon had Bryan not been cleared that it didn’t make much sense from a story point of view if Bryan wasn’t cleared. Bryan responded that the way it played out didn’t make a lot of sense either that they teased this program between the two, he’s cleared, and they became tag partners against Kevin Owens & Sami Zayn. Don’t get me wrong. I love Rocky. I think he’s great. Love everything he’s done for this business. But my gut, my first instinct, says we don’t need him. We don’t need him. If we’re not the guys who can main event WrestleMania, then how are we ever gonna be The Rock? How are we gonna be Stone Cold Steve Austin? We can’t hold onto these guys forever. We just can’t. To me, let’s do Seth Rollins-Roman Reigns before we do Seth Rollins-The Rock. That’s me. **The NFL’s pre-season appears to be hurting Impact Wrestling a lot this year. This week’s episode was up from last week’s average with 210,000 viewers. However, that is still their second-lowest average of the year following last week’s average of 168,000 on POP. **The WWE has announced an extension to their television partnership with the 9GO! Australian broadcaster. Raw will continue to air as a one-hour version on Thursday nights at 11:15 pm and SmackDown on Fridays at the same time. Last month, they announced an extension with Foxtel to air Raw live on Tuesdays at 10 am and SmackDown on Wednesdays at 10 am on FOX8 with FOX Sports airing one-hour versions of the show in prime time as well. **Elias sent out a note that his concert at the Gramercy Theatre on Saturday has been canceled. The concert was scheduled to start at 5 pm and earlier this week, Elias posted that the concert would end no later than 6 pm (which suggests they were concerned that people felt it would overlap with TakeOver starting at 7 pm). It sounds like this was an idea they threw against the wall that didn’t stick. Elias is performing at SummerSlam so you would expect some sort of angle during that segment. **Natalya Neidhart wrote a tribute for her father in the Calgary Sun this week. **Ring of Honor is in the UK in the middle of their Honor Re-United tour, which continues Saturday in Doncaster and wraps up Sunday in London. The shows are streaming for Honor Club subscribers. Talking about all that stuff was hard. It just sucked. I was really nervous before I watched, but after watching it, I was like, ‘Wow, that was honest, and open, and raw, and I was really pleased with the outcome of it all.’ But … I’m not going to lie, it was tough and I’ll be starting my community service this week for my recent arrest. But everything’s over, I’ve just got to make everything right now, and I’m underway and that was my first and last DUI. I grew up with apraxia, which is a motor speech disorder. I had years of speech therapy, and I’ve always had problems slurring or mispronouncing my words. In the ring, it’s so important that you speak so clearly and you’re easy to understand and that you don’t falter at all, that it makes me more nervous and more likely to actually mispronounce things. It’s been really great for me to be able to work on it and overcome those fears that I’ve had since I was a little kid. **Lucha Underground’s television viewership dropped 15% this week with 97,000 viewers tuning in on Wednesday on the El Rey Network. The show featured The Mack, Son of Havoc & Killshot defending the Trios championships against The Reptile Tribe, which was set up in the opening segment. **Billy Gunn has been added to the Over Budget Battle Royal at “All In” on September 1st at the Sears Centre. Gunn joins Colt Cabana, Moose, Jordynne Grace, Rocky Romero, Brian Cage, and Ethan Page. The winner of the battle royal will face Jay Lethal for the ROH title on the pay-per-view portion of the card that night. **Satoshi Kojima returns to New Japan Pro Wrestling on Sunday, September 9th on the Road to Destruction tour following an ACL injury this past January. Kojima will be turning 48 years old next month. They have not announced who Kojima will be working with for his return. **MLW has announced that Low Ki will defend the MLW title against Rey Fenix on September 6th at their television tapings in Fort Lauderdale, Florida. That same show is headlined by a War Games Match and will also feature Pentagon Jr. vs. LA Park in a Mexican Massacre Match, as well as PCO taking on Brody King. The card takes place from the War Memorial Auditorium. **Ring of Honor has announced that EVIL will be part of their television tapings on Saturday, September 29th in Las Vegas at the Orleans Arena. **Lee Daly, a writer out of Ireland, has launched an Indiegogo campaign to raise funds to produce a book on the history of the PRIDE Fighting Championships that will run for the next three weeks. -The highlight of the episode was a match between Fenix and Sami Callihan. Fenix executed so many outstanding springboard maneuvers, including a twisting cutter off the elevated ramp into the ring and a springboard from the ramp into a top rope Frankensteiner. The Crist brothers got involved and led to Pentagon Jr. coming out to continue their feud. Fenix hit a twisting muscle buster into a driver for the win over Callihan. Later in the show, Callihan challenged Pentagon Jr. to a “Mexican Death Match” next week (which was taped this past week in Toronto). This was the match to go and check out from this week’s show and the strongest part of the show. -The “Smoke Show” segment debuted with Scarlett Bordeaux interviewing KM and Fallah Bahh and turned into a very funny segment. I feel Bordeaux is a tremendous personality and carried the segment well as the interviewer with KM & Bahh playing off her well. -The show built to the outdoor street fight between The OGz and LAX that was shot in downtown Toronto. It was well produced and didn’t drag, as they only kept it to a few minutes. It ended with Santana & Ortiz laying out Hernandez with slapjack and whipping him with it. Konnan grabbed the weapon and the closing shot featured Eddie Kingston on his knees daring Konnan to hit him, Konnan whipped it at his head as the screen cut to black, insinuating he killed Kingston. It seems that attempted murder and actual murder are in vogue between Impact and Lucha Underground. -It has been 17 years since the “What?” chant began, and I didn’t think I could find anything more irritating than an audience chanting that word at performers. It turns out that if you’re in a smaller venue and ONE PERSON is yelling it over-and-over, it is even more annoying. Austin Aries and Killer Kross had to fight through their promo while one guy kept yelling “what?” and never interrupted their flow and I was impressed they kept their composure because it drove me nuts listening to this. -They are promoting a special edition of Impact called “Redefined” on August 30th and announced Brian Cage defending the X division title against Fenix on that show. John Pollock & Wai Ting review Bash at the Beach from San Diego with Hollywood Hogan & Dennis Rodman taking on Diamond Dallas Page & Karl Malone, plus a look at WCW’s business in the summer of ’98, the state of Bret Hart’s status with the company, Bill Goldberg coming off his WCW title win and much more from this era.